Can you can? Yes you can!!! Interested in canning? Your grandma did it. Your mom thought she didn't want to learn, but now YOU want to learn!! Canning is coming back baby!!! Picking and preserving your food at its height of freshness DOES make a difference. 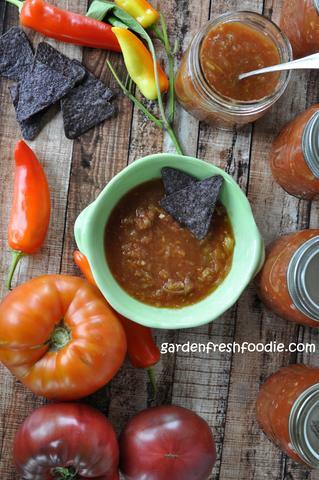 Canning, along with freezing, helps you to extend your harvest throughout the year and make some pretty yummy items. Plus-it's really no hard to learn! If you've ever made jam before you have probably been disgusted at the sugar to fruit ratio. Typical ratios are 1:1. That is 1 cup of sugar for every 1 cup of smashed fruit you're using! Wowsa! I couldn't take this. I also didn't want to use refined sugars in my jam. After a little research, I found this great company called Pomona's Pectin. They are a small family-run business and have a Jam Hotline that they answer to help with any questions you may have!! They use a pectin derived naturally from apples and allows you to use little to no sugar. Ball low-sugar pectin still require a bit of sugar, and I feel the taste is always a little off. When you use other brand pectins, you are also warned about making larger batches. I feel that the only way to get your canning done is to do it in large batches! Pomona's Pectin lets you do this too. Fill your canner with water and bring to just under boiling. When canning, the biggest thing is to have all of your jars, rings, and lids ready to go. Make sure they've been washed with hot soapy water. As you're making the jam, place jars and rings into canner with hot, almost boiling water. Mash berries/fruit in a pot, add lemon juice, cinnamon, and calcium water (for real recipe-visit www.gardenfreshfoodie.com). Place pectin into maple syrup and pour into jam, bring to a boil for 1-2 minutes. 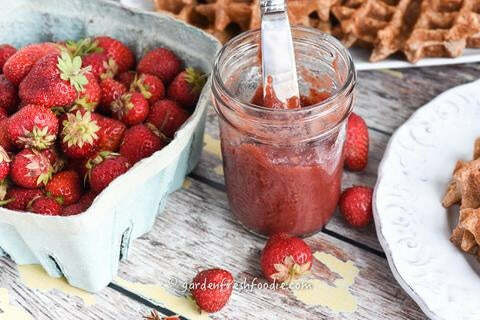 Fill jars with hot jam. Wipe tops of jars, making sure tops are clean. Drop lids into hot, almost boiling water for 10 seconds, remove and place hot lids on top of jars. Place rings around jars and place into canner. Lower into boiling water. Place lid on canner and boil for 12 minutes. Remove from water and allow jars to completely cool. 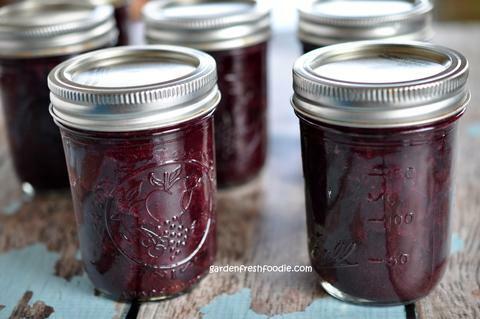 You should hear popping noises, as jam compressing in jars and causes pressure to change inside jars, forming a seal. Check seals, by trying to pull up on lids after jars have cooled. They should also appear indented on tops if sealed properly. If jar didn't seal, place into fridge to be eaten withing 2-3 weeks or freezer for up to 6 months.